Before all of that… there was this; CB Radio. People these days think they know what that was. They have their tropes and their prejudices. It’s safe to say, though, that if you weren’t there, you don’t really know what it was. What if wasn’t (just to say), for me anyway, was Truckers and ‘10-4, good buddies’ and Country Music and Convoys and Smokies on the Run. Nope, it wasn’t any of those things. It was something quite different. Something quite similar, in its way, to what we have today. I remember how it started, though I can’t quite remember the year. I would guess it was 1978 or so. I was sitting in my living room at home, on a Friday night. School was over for the week and I was trying to get a good BBC picture on the telly for the late night movie, which I think was Polanski’s ‘Dance of the Vampires’. In those days, we got a shaky BBC signal which sneaked in between the mountains from across the border with Northern Ireland. It faded in and faded out and this was sometimes frustrating but sometimes it seemed to make an average film more involving and quirky. So there I was, alone (everybody else had long gone to bed) drinking tea and enjoying the cheesy movie. Suddenly, out of the blue, a voice came over the TV, infinitely clearer and crisper than the crackled film reception. The voice, that of an elderly man, spoke what was obviously one side of an amateur radio conversation. I had never heard anything like this before on my telly. It quickly became more interesting than the film (which I had seen before). Who was this man? Who was he talking to? I listened until he was finished talking and I can still remember how he signed off. “Wishing you all you wish yourself. Good night”. I found out from my Dad that he was an elderly man who lived a few streets away from my house. A veteran of Ham Radio, he had descended to the lower wavelengths to take part in the local discussions which has sprung up in our town via the blossoming medium of Citizen Band Radio. I spend quite a few evenings, after the house was still, listening to him chatting rather aimlessly to the unhearable people on the other end of his line. Not being able to afford a CB of my own, my friend and I took to chasing stray signals around town using an ancient plastic walkie-talkie that I resurrected from an old toy box in my brother’s room. This thing has only one channel so it was a rare occasion when a CB-er landed on that channel and started transmitting. But it did happen from time to time and the excitement of making a contact in this way is something I still remember quite vividly. Eventually, I got my own CB Radio. It was an uninspiring black box, much less fancy that those which other people had. But my CB had been carefully chosen. It had 80 channels, as opposed to the normal 40 channels and this allowed me to follow the more serious users who would sometimes ‘Go High’ to the bigger numbers on the dial to escape the slightly more inane chatter one might encounter on the busy lower channels. That summer was my CB Summer. Every evening, as dusk drew in, I would take my gear to the car which was parked in the back yard. I would wire it up to the car battery and then I would sit there until two or three in the morning, chatting to whoever came on. There was no ‘lingo’ or ‘ stupid stuff’. These were mainly people who got on well but who did not have the economic or transport resources to meet up in person. We'd talk films and town-matters, we joked and smiled and encouraged each other a bit. We rarely, if ever, met up. Winter became hard in the car. Running the heating could quickly kill the battery so there was lots of coats and a wool hat. For Christmas that year, I got the best present ever (widely hinted-at) – a transformer which enabled the CB to run from the electrical supply in the house. Once more sitting by the fire in my sitting room, late at night, with my magnetic aerial attached to a tea tray, I felt like the king of the world. This nightly chatter was, by necessity, a local enough affair. The VHF bands we utilised operated largely on ‘line of sight’ parameters. We spoke to people relatively close to us, and that was all. Then something quite different happened. It all sounds a bit far fetched now but it had everything to do with solar activity and sun spots. Basically, we hit a period of high solar activity and this increased the ionispheric refraction of the atmosphere. In our terms, the ‘Skip’ went ‘High’. This created an anomaly wherein people on tiny CB radios on the other side of the world could be communicated with directly via our own puny boxes. Suddenly we could all be Ham Radio people. We built bigger aerials and stuck them on our back sheds and we called ‘CQ DX’ into our power mikes to make faint and fleeting contact with far away folk. The ‘Skip’ was like the tide. It came in and went out at differing times of the day. CB people would meet on the street sometimes and tell each other that ‘The Skip was High’ in the same way that we imagined surfer people would tell each other than the ‘Surf was Up’. Generally the VHF bands were quiet and clear until somebody opened their mike and spoke. When the skip was high the airways were filled with the hissing, bleeps, and mumbles of a myriad of different transmissions. From time to time, a clearish voice emerged from the jibber-jabber and that was the moment where you tried to make contact. 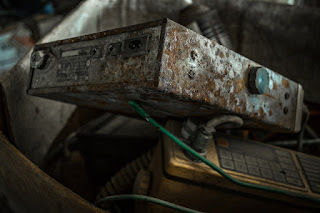 You called ‘CQ DX’ and identified your 'station' , usually your initials and a random number for show (I was Kilo Alpha 147) and you waited to see if the distant voice picked you out of the ether to chat to. Sometimes a voice would come in as clear as a bell, as if they were right there in the room with you, although they were actually many thousands of miles distant. It was both fascinating and a bit strange. The ‘Italians’ were the bane of the long distance CBer. You might be in the middle of a delicate exchange with some dude in deepest Canada when the ‘Italians’ would come on the air and destroy everything. With their more powerful equipment (illegal in our country) they would power up their systems using long piercing whistles which would banish the far-away Canadian back into the deepest recesses of the Skip Noise, long before you could get an address from him. An exchange of addresses was the prize. This would often mean an exotic postcard received from the person on the other end, confirming the exchange. We sent these off too, sellotaping pennies to the back of our cards as memorabilia of the country we came from and hoping from something of the same in return. And all the while, when the skip was low, the local conversation went on, long into the nights. In truth, the technology was not a very big part of it for me. I rode the Skip when it was high but, mostly, I just liked to chat. And, just like it was when I was fourteen, there aren’t often too many people around to chat to. I still like to chat, though not on CB. So I reach out, as I always seem to have done, for a warm voice to share a thought with. CB, Usenet, Facebook, Twitter, it’s all been the same. How did it die? CB Radio. When did it end? I don’t clearly recall. I’d like to think that the skip rose up and rose up until the background murmur became a roar and regular communication was no longer possible. That would suit a subtle analogy I’m trying to perhaps shoehorn in here. But it wasn’t really like that. In truth, I think the more meaningful voices simply just fell away, one by one, over time, until the only voices left were too loud and without any real substance. Until the seesaw finally tilted and it seemed more trouble to stay than to go. I think maybe all of my Social Media manifestations have ended this way. I think they may continue to do so. But hey, while they lasted, they were fun. I have to say I was never remotely interested in CB Radio. I don’t even think I saw Convoy when it first came out and I’ve a sneaking suspicion I’ve never actually seen the entire film although I do believe I caught the ending once whilst waiting for something else to come on. At the time there was a lot going on in my life. I got married around that time and talking to strangers (mostly other blokes as I perceived it) was of no interest. Perhaps if I’d been a few years younger like you. I did try the whole pen pal thing somewhere in the sixties but the problem with that was there was nothing going on in my life I especially wanted to talk about with a complete stranger so I think I gave up after a couple of letters or he gave up on me. My Mum wouldn't let me have a Pen Pal. "They'll turn up at the door with a suitcase." I suspect that you're right about how social medias die: it felt right when I read it. I think I had friendships that ended similarly when I was younger, but maybe I'm misremembering.